Bee jewelry is great for fashion and expressing love for nature. It comes in different styles and shapes. 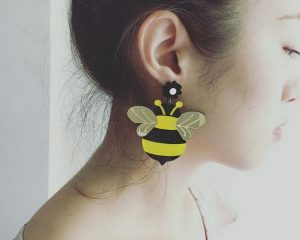 The BeeKeepShop offers some unique honey bee jewelry pieces for your collection. These jewelry items are classy and trendy. This compilation covers excellent brooches, rings, earrings and stud earrings. It also includes a few pendants for your necklaces and bracelets. The bee jewelry pieces outlined below are a beautiful mix of both vintage and modern styles. This Zircon Stone Bee Ring is a classy copper finger ring. 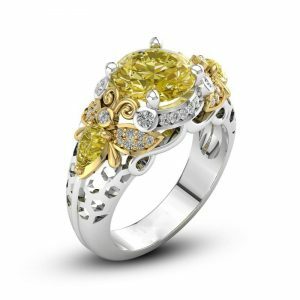 It has zircon stones of a yellow shade. The stone mimics the natural color of honey. This ring comes in a silver color on the metal part. It is a statement ring that is great for women and makes the wearer stand out. The Zircon Stone Bee Ring is a great accessory to wear to a party. You can also use it as a wedding or engagement ring. This bee ring is romantic and trendy. It makes your woman feel like a queen. The ring is light and safe to wear on your hand. It does not irritate the skin on your fingers. This bee ring is made in the channel setting style. The Miraculous Queen Bee Ring is made in a simple yet classy design. It is great for both men and women. The ring is simple and comes in a gold color. 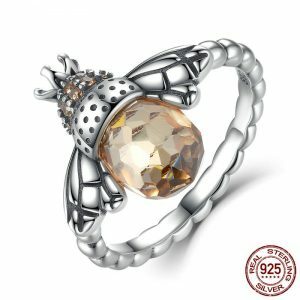 The Miraculous Queen Bee Ring is made using zinc alloy and plated with antique silver. It has blue stones and decorative designs on its sides. The ring looks very beautiful and can be worn to most social gatherings. You could also use it as your regular statement ring. This ring is available for purchase in 3 sizes: 6, 7 and 8. It weighs 0.08 kg and has a surface width of 0.8 cm. This is a great ring for anniversaries and can be given as a gift. 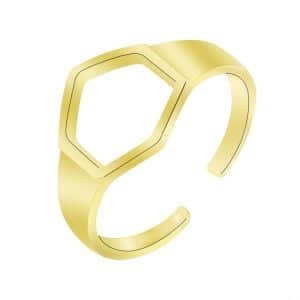 This Adjustable Open Hexagon Bee Ring is pure class and simplicity. It subtly adds to your fashion taste without being too conspicuous. The ring is adjustable and not closed. It can fit more than one finger size. This ring comes in two color options: gold and platinum plated. It features thin black lines on the sides and on the hexagon at the top of the ring. This bee ring is made in a vintage style. It is a unisex ring with a surface width of 11mm. The ring is made using copper and very safe to wear. It is made in the tension mount setting style. Use this ring to add elegance and sophistication to your personality. The daisy flower is a symbol of all that is good in love and relationships. It stands for beauty, fertility and innocence. This Daisy Flower Open Bee Ring is a great piece for when you are looking for a new beginning in your love life. The ring inspires positivity and charms those around you. It is suitable for wearing by women. This open ring fits more than one finger size. It is made using authentic sterling silver with some cubic zirconia gems on the daisy flower of the ring. This is a beautiful ring that makes an excellent gift item. The ring has a surface width of 2mm and is made in the prong setting style. It comes with a free jewelry bag upon purchase. The ring is timeless and made in the ever-fresh vintage style. This Vintage Bee Ring ring features a bee on its head with pearls has a black main stone. It has pearls on the wings of the bee and red gems on the abdomen. The ring is beautiful to look and easily makes a statement adorning your hand. 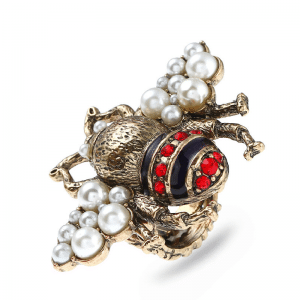 This Vintage Bee Ring with Pearls is a great piece to wear to any gathering or event you are attending. It helps you stand out and adds strength to your personality. Buy one today for yourself or gift one to a close friend. The Honeycomb Engraved Heart Bee Ring is a uniquely made ring. It has a fresh design that makes it stand out among rings in its class. The ring has a shank made into honeycomb shapes and features a bee on its head. On some of the honeycombs in the shank of the ring are heart shapes. This heart bee ring is great for gifting to loved ones. It is great for relationship anniversaries and engagement. The ring comes in 3 color options and 3 sizes: 6, 7 and 8 are available as you make your order. Get one of these today and show the fashion geeks around you that you too have a great fashion sense. The Bee with Snowflake Open Finger Ring is made using sterling silver. It also incorporates cubic zirconia in the head of the ring. This ring is a strong fashion statement. It features a bee on one end of the ring and a snowflake on the other. The ring has a silver color broken by yellow-orange on the bee. Some black of oxidized silver adds mystique to the ring. This ring is great for women. It is especially suitable for engagements. It is a discreet ring that brings out femininity very well. Try it out today on your finger, or as a gift to a lady who is close to you. The ring has a surface width of 2mm. The Bee & Poetic Daisy Flower Open Ring inspires you spiritually. It is a simple ring that is very discreet. The ring features a bee and a daisy flower on the head of the ring. The shank is 2mm wide and the ring is made in the popular prong setting style. This poetic ring is made using sterling silver and shows great craftsmanship. It has some very lovely cubic zirconia as its gems. You get a free jewelry bag with every purchase of this daisy flower ring. Get one today and enjoy the beauty it add to you. The ring works great for women of all fashion tastes. It is a very trendy and classy ring. 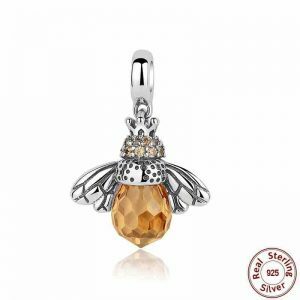 The Sterling Silver Orange Zirconia Bee Pendant is a beautiful addition to your necklace. 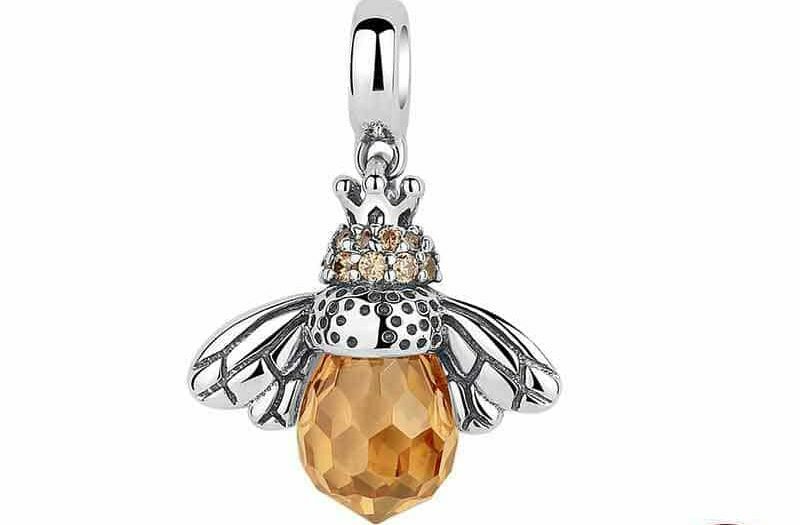 It is made in a bee-inspired design with silver and orange colors. The ring is well detailed and very durable. It is made using sterling silver and laid with zirconia stones. This bee pendant is light in weight. It is small and very discreet but makes a bold fashion statement. The sterling silver pendant looks great on women and makes them very beautiful. Use this silver and zirconia neck adornment today and experience the air of sophisticated class that it gives you. The pendant works with many necklace types and sizes. It is great for customizing your bracelets too. 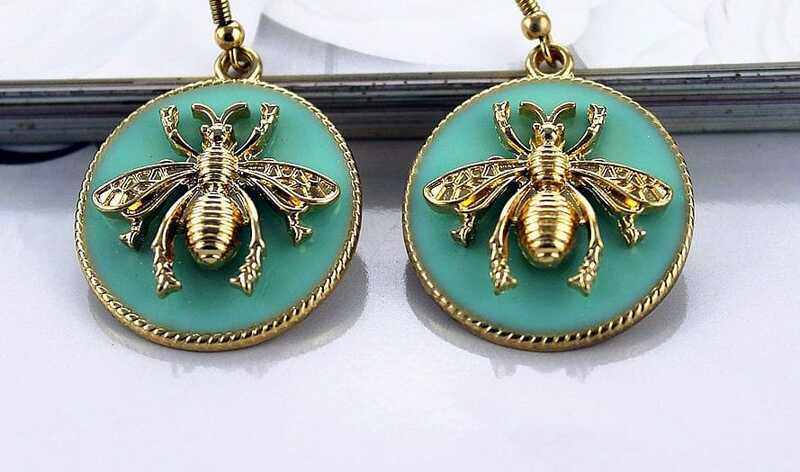 These Light Green Bee Earrings for Women are bold fashion pieces. 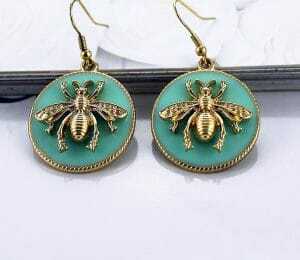 The earrings are made by placing a bee figurine in a round light green background. The bee is made in metallic gold colors. It contrasts well with the background and speaks boldly. These earrings are made using zinc alloy and acrylic. They are built in the drop earrings style. The Light Green Bee Earrings for Women are a classic style pair of ear adornments. They are great earrings for women who like trying out bold colors. The earrings are a great choice for parties and events where bold and flamboyant fashion is not frowned upon. Buy a pair now and enjoy the free-spirited look they give you. Brooches are great fashion accessories for both men and women. They go onto your lapel, hat, scarf or any other place you can display them. 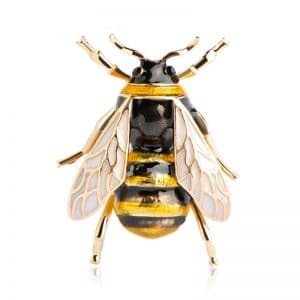 This Shiny Black & Yellow Enamel Bee Brooch is a fashionable brooch that sends warmth to you and those around you. 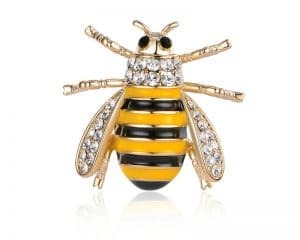 The bee brooch is made using zinc alloy and rhinestone. It is beautiful, classy and complements your outfit very well. This enamel bee brooch is great for bee and nature lovers. It is also a great item for when you want to try out something new and safe with your look. This bee brooch works well as a gift item too. Get one for yourself or a person you love today. This Honeycomb Pendant Necklace is made of link chain that holds up well. It can even withstand tugs by babies without breaking. The necklace features a pendant that rests on your upper chest. This pendant is made in a honeycomb design. You have two options when buying the honeycomb pendant necklace: honeycomb framed in a heart-shaped gold band and honeycomb without framing. 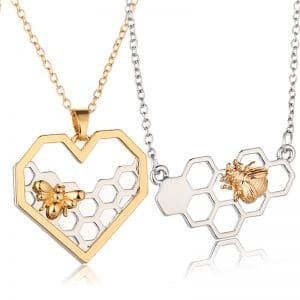 Bee miniatures feature on both designs of the pendant necklace, resting on the honeycomb. Get this Honeycomb Pendant Necklace for a woman in your life today and they will love it. The necklace adds to the natural beauty of women. Its colors allow it to work easily with different outfits. Buy this Black & Yellow Honeybee Brooch and get an interesting edge in your fashion. The bee brooch is in strong colors that make it very visible. It is suitable for your dress, on suits, caps, and scarves. This honeybee brooch transforms your attire into a chick opulent look. This brooch is light in weight so you hardly remember you are wearing it. It is great for women. The brooch is made with excellent craftsmanship and is well detailed. Zinc alloy and crystal are the materials used in making the brooch. This Black & Yellow Honeybee Brooch is safe to wear and glitters on your outfit. It is customizable and would make a great gift as a decorative fashion item. This finger ring is a uniquely designed using sterling silver. It has cubic zirconia crystals in it that give the ring very great colors. 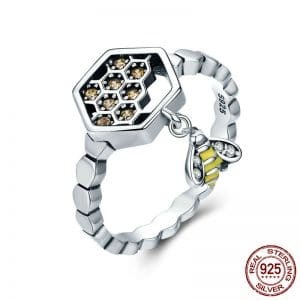 The Sterling Silver Bee with Honeycomb Ring features silver, yellow and black colors. It has its head made into a hexagonal shape framing honeycell replicas. On the side of the head hangs a small bee figurine. This ring is solidly constructed and very durable. It is safe for your skin and does not irritate it. Get this ring as a Valentine ’s Day gift for your woman. The ring is available in 3 finger sizes: 6, 7 and 8. 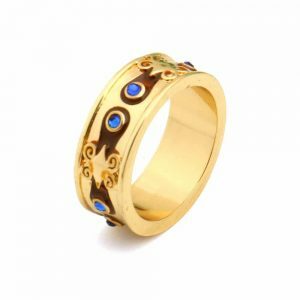 It is a very beautiful classic fashion ring that makes a bold statement whenever you wear it. This Sterling Silver Bee & Ladybug Flower Ring is a colorful ring for nature lovers. It is a great ring to express your consciousness about nature. The ring features a bee and a ladybug on its head. It is made using sterling silver and crystals of cubic zirconia. The ring has high-end fashion look and is very cute. It has a width of 2mm and is available in finger sizes 6 to 8. 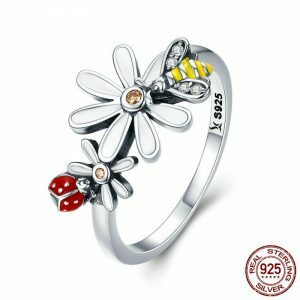 This sterling silver bee and ladybug flower ring looks very good on women. It is great with different outfits. The ring has silver, black, yellow and red colors that make it hard to miss. 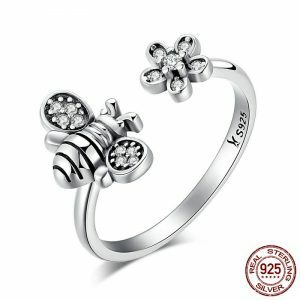 The high-quality materials used to make the sterling silver bee and ladybug flower ring give it excellent durability. 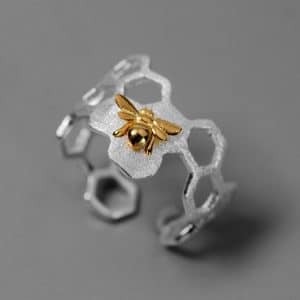 This Sterling Silver Open Honeycomb Bee Ring is a statement piece. It is made to fit more than one finger size with its open design. The ring combines silver and gold colors very well. It features a miniature bee figurine on the head. The surface of the ring is made into a honeycomb cell design. The Sterling Silver Open Honeycomb Bee Ring is trendy and adds class to your fashion outfit. It glitters even in dim light and is safe on your skin. The ring is suitable for both men and women. It is a great gift and can be used as a commitment ring in anniversaries, weddings and engagements. 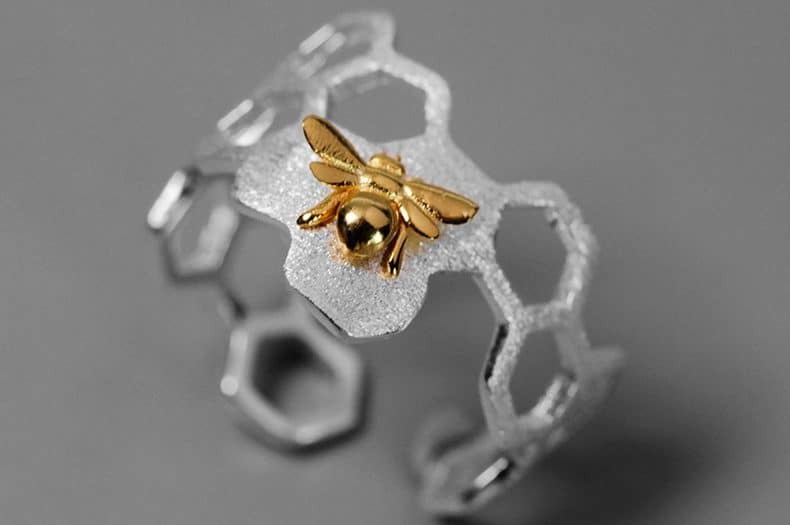 This beautiful honeycomb bee ring is a great addition to your ring collection. Made using authentic sterling silver, this ring is durable and very well crafted. It has a solid build that is seen in the whole ring. The ring features a bee on its head with the ring shank spreading out from the wings. 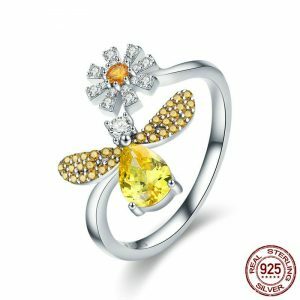 The bee on the ring’s head is made using sterling silver and zirconia. It has silver, black and faint yellow colors that make it very visible. 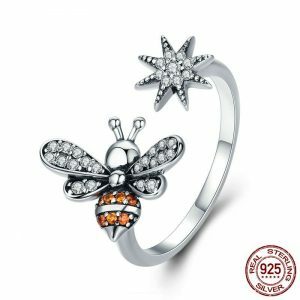 This Authentic Sterling Silver Zirconia Bee Ring has a classic look. This is the ring to show your love for a lady in your life. Use it today to remind your loved one how much you appreciate them. This ring is great for women who want to make a fashion statement. 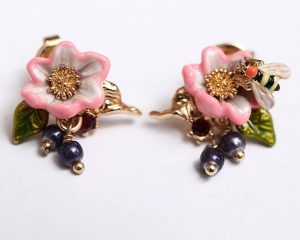 The Bees in Flowers Enamel Stud Earrings are a colorful pair of stud earrings. They are made into a flower design with a leaf and a bee perched on the flower. It combines pink and yellow colors in the flower, green on the leaf and purple on two berries hanging from the stud earring. The bee on the flower is colored black, yellow and red. This mix of colors makes the bees in flowers enamel stud earrings hard to miss. It is beautiful, nicely sized and makes a bold fashion statement. This reasonably priced enamel stud earring works well on women to add to their natural beauty. Buy one now for the special woman in your life. Here is an earring set for dainty women. 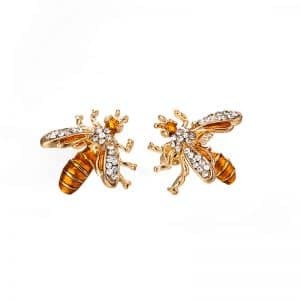 These Golden Crystal Bee Earrings are small and built into a bee figure. The body of the bee features different-sized crystals. The classic set has its head and thorax in a silvery color and the abdomen is colored blue. They come in 5 different colors to meet your different tastes. The wings of the bee miniature are gold colors with black on the edges to outline them. 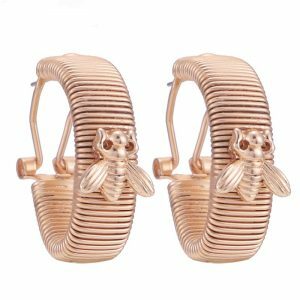 These Golden Crystal Bee Earrings are not only cute but very visible. They are the perfect earrings for your woman, given as a gift or to mark an anniversary. The earrings are made using zinc alloy so they do to irritate the skin. Five metal color options are available with these Red Cherry Crystal Bee Drop Earrings. The earrings are great for when you want to show your love to a woman. They are made with excellent craftsmanship using zinc alloy, sterling silver and cubic zirconia. 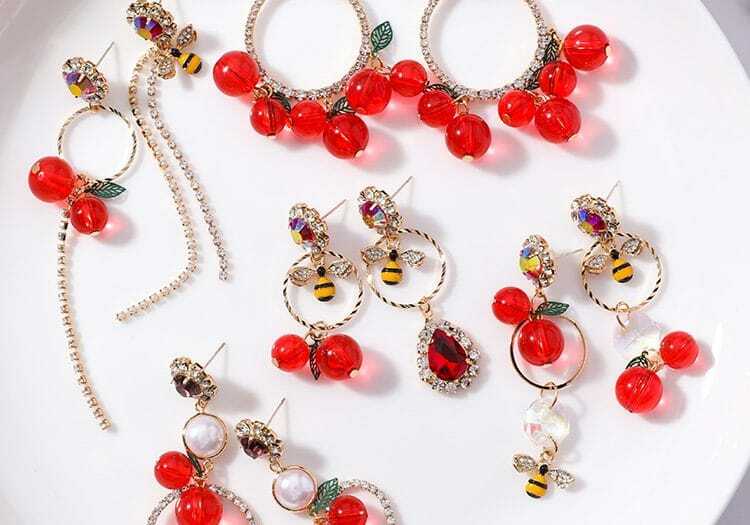 These Red Cherry Crystal Bee Drop Earrings are made to resemble red cherry fruits hanging from your ears. They have unmatched beauty and are not too heavy on your ears. These earrings are made in a trendy drop style that is both fashionable and very pretty. They are great for women who are comfortable trying out colors with their outfits. The earrings are an adorable gift to any woman. These Trendy Bee Personality Earrings are excellently crafted using zinc alloy. They have a gold-brown color with a tinge of silver on the edges. The earrings are small, cute and very pretty on your ears. They are made in a shape of a bee. The wings of the bee feature rhinestones that make the earrings stand out. these are elegant fashion pieces that make the perfect ear adornments. These earrings confer immense beauty to the wearer. They also work well with any matching outfit you have. The earrings are fashionable and very classy. They do not irritate your skin even when you wear them for long. Buy a pair today for yourself or to give a woman in your life as a gift. Buy these Embroidery Flower Bee Stud Earrings to complete your party outfit. They are embroidered using cotton yarn onto a metal superstructure. The earrings are circular and nicely sized. Yellow, pink, black and white colors are used to make a bee figure on a pink background. The metal used in these embroidery flower bee stud earrings is friendly to your skin. It does not irritate or discolor the skin on your ears. Get these earrings in any of the 4 available color options. The earrings are alluring and very trendy. They give you a look of confidence since you make a bold statement with these earrings. These are earrings that every woman should have the pleasure of wearing in their lifetime. 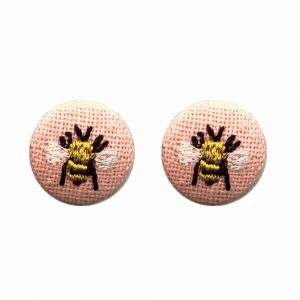 These Round Stud Bee Earrings give you a powerful classic look. They create a great aura around you with their fashionable design. These stud earrings are small and cute. They make you look more beautiful and work well with many different outfits. The earrings come in two color options; gold and silver to meet your varying tastes. The Round Stud Bee Earrings are made in a simple round design with bands around the surface of the studs. A small bee figurine is on the apex of the ear studs. There is not much play with colors on these earrings. They are very simple yet solidly built to last for long. 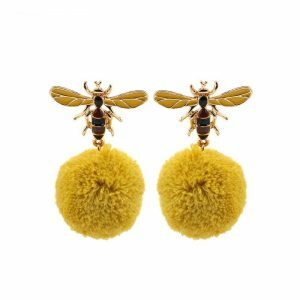 These Pompom Bee Drop Earrings are fashion statements that stand out. They are made into a bee shape with a pompom hanging under it. The bee part is metallic and features gold, black and silver colors. The pompom is evenly colored yellow. These bee drop earrings are available in 3 metal color options; black, white and yellow. The Pompom Bee Drop Earrings are very classy and show you are updated in the latest fashion trends. Skin-safe zinc alloy metal is used to make these earrings. The earrings are a safe choice for romantic women who are looking to make a statement and add a bit of elegance and fun to their appearance. When you are looking for large drop earrings, these Acrylic Striped Bee Drop Earrings are a great choice. They are built in a bee shape and are colored black, yellow and silver. The bee is not built to scale but looks very cute nonetheless. 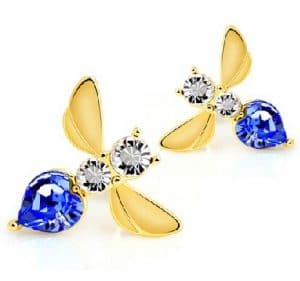 These bee drop earrings are trendy and very fashionable. They hang down your ears and add to your prettiness without being too weighty on your ears. Get a pair today for your earring collection or for a woman in your circles. These earrings are very safe to wear on skin. They redefine beauty on the woman wearing them. These drop earrings are bold and built for the daring women to project their strong personalities. 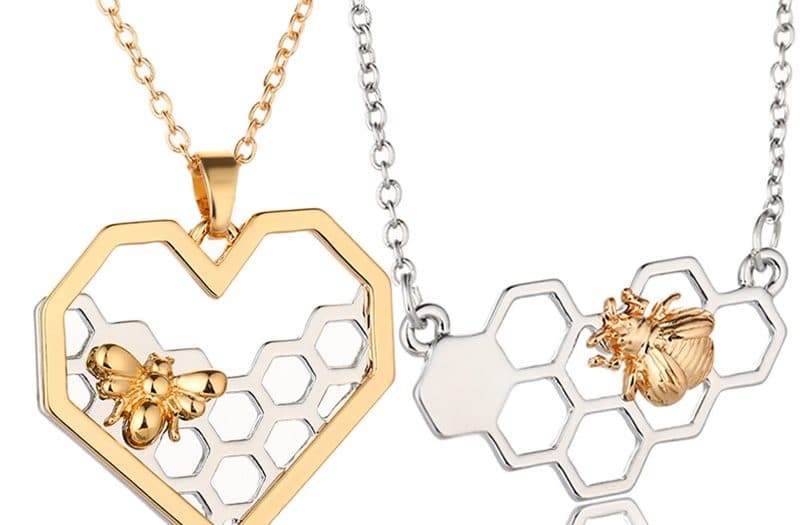 These unique honey bee jewelry pieces are perfect for modern fashion-conscious people. They include items for women and a few for men. Use any of these pieces to bring out your personality and make fashion statements in events and gatherings you attend. The pieces are perfect for gifting and appreciating people in your life. Buy a few pieces today and enjoy the elegance they add to you whenever you step out.